The overall incidence of all complications of otitis media has decreased since the advent of effective antimicrobial treatment. For example, in the preantibiotic era, the incidence of mastoiditis requiring surgical treatment was 25-50%. In the 1980s, the incidence decreased to approximately 0.02%. In 1995, Kangsanarak et al conducted a review of 24,321 patients with otitis media that revealed an intracranial complication rate of 0.36%. The most common extracranial complication is postauricular abscess, and the most common intracranial complication is meningitis, although complications often occur together. One large series of South African patients found that nearly 80% of extracranial complications and 70% of intracranial complications of otitis media occurred in children in their first 2 decades of life. The risk for complications associated with otitis media increases if an acute episode of otitis media persists longer than 2 weeks or if symptoms recur within a 2-to 3-week period. In the preantibiotic era, the mortality rate from intracranial complications of otitis media was reported to be as high as 76.4%. A review of 24,321 patients (from 1978-1990) who had intracranial complications associated with otitis media identified a mortality rate of 18.4%. Despite adequate treatment, approximately a third of patients with meningitis, a potential complication of otitis media, develop permanent neurologic sequelae, including seizures and behavioral disorders. A high index of suspicion is necessary in order to diagnose a complication of otitis media. The persistence or recurrence of acute infection within 2 weeks of treatment suggests impending complications. Complications typically are associated with subacute or chronic infections, but acute otitis media remains the most common cause of meningitis. Meningitis in the setting of acute suppurative otitis media in a child may suggest an anatomic abnormality such as a Mondini malformation. 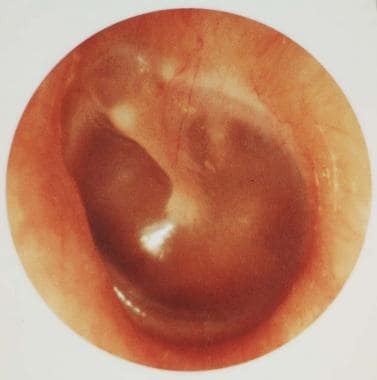 A Mondini deformity is a specific type of inner ear dysplasia, which may present as a spontaneous perilymphatic fistula due to a stapes footplate deficiency. This anatomic abnormality may predispose the patient to recurrent meningitis and profound sensorineural hearing loss. A brain abscess may occur in the temporal lobe or cerebellum, typically from chronic otitis media. An epidural abscess may occur as a result of bony destruction and extension from coalescent mastoiditis or cholesteatoma. Meningitis may be associated with acute or subacute/chronic infection. Acute otitis media is the most common cause of meningitis. Extradural granulation tissue or frank pus may be found. In adults and children, meningitis in the setting of chronic suppurative otitis media may be secondary to the direct extension of infection through the dura, through a previous stapedectomy site, or through a cholesteatoma-induced labyrinthine fistula. A sigmoid sinus thrombosis or subdural abscess/empyema may be associated with otitis media. Otitic hydrocephalus may occur as a result of increased intracranial pressure secondary to middle ear infection and complicated by sigmoid sinus thrombosis with total occlusion. A fine-cut computed tomography (CT) scan of the temporal bones will evaluate the integrity of the bone of the tegmen, otic capsule, posterior fossa, and facial canal. It will show soft tissue causing coalescence of mastoid air cells in mastoiditis, and may show destruction of the overlying cortex with overlying postauricular abscess formation. A frank subperiosteal abscess is found in only 48-49% of acute mastoiditis cases. A contrasted CT scan will detect abscess formation or sigmoid sinus thrombosis. The delta sign is a triangular enhancement of the wall of the sigmoid sinus suggestive of thrombosis. Meningitis, facial paralysis, brain abscess, otitic hydrocephalus, sigmoid sinus thrombophlebitis, and intracranial abscess may also occur without evidence of bone destruction, as observed on CT scan. A contrasted magnetic resonance imaging (MRI) study of the head should be performed if intracranial abscess formation or sigmoid sinus thrombophlebitis is suspected. Enhanced MRI is sensitive for sigmoid sinus thrombosis. Additional imaging with MR venography demonstrates the degree of patency of the related venous sinuses. MRI is superior to CT in the identification of intracranial suppurative lesions, meningeal inflammation, and extradural granulation tissue. The T2-weighted images can identify intraparenchymal edema and thus be used to make an earlier diagnosis of impending intracranial complications than can be made with CT scanning. Acute suppurative labyrinthitis may present with enhancement of the cochlea, labyrinth, and/or internal auditory canal contents. Electrical excitability tests, such as electroneurography (ENOG), are appropriate in cases of acute otitis media accompanied by complete facial paralysis. Perform ENOG after the third day of complete facial paralysis associated with acute otitis media. Greater than 90% electrical degeneration of the involved side indicates that potentially irreversible nerve damage has occurred. Total facial nerve decompression may be warranted in cases of 90% or greater electrical degeneration. Always determine hearing status at some point during the course of treatment. Sensorineural, conductive, or mixed losses may be identified depending on the clinical scenario and must be monitored and addressed accordingly. Monitoring of visual acuity and visual fields is essential in otitic hydrocephalus. If deterioration is progressive, fenestration of the optic nerve sheath may be warranted. Lumbar puncture is indicated in suspected meningitis. Avoid this procedure until imaging studies are performed to exclude a brain abscess. Brain herniation can result in the face of sudden release of intracranial pressure if a brain abscess is present. Obtain cultures from the septic focus to guide therapy; however, they may fail to reveal the true pathogen in at least 25% of cases of otorrhea. Extracranial and intracranial complications (with the exception of uncomplicated cholesteatoma and chronic suppurative otitis media) usually require admission to the hospital. CBC count and ESR may be helpful in monitoring response to therapy. Initially, IV antibiotics are directed toward the most common pathogens, followed by culture-specific antibiotics. Due to an increasing incidence of penicillin-resistant Streptococcus pneumoniae, consider the empiric use of vancomycin until culture results are finalized. Acute otitis media resulting in acute/subacute mastoiditis, meningitis, or intracranial complications is best treated with a third-generation cephalosporin. Complications of chronic disease generally require broader coverage to include pseudomonads and anaerobic organisms. Furosemide and mannitol initially are effective in lowering intracranial hypertension in otitic hydrocephalus; however, definitive treatment requires mastoidectomy with exposure and removal of extradural granulation tissue. Most infectious disease consultants recommend a total of 2-4 weeks of IV antibiotics for intracranial complications. A 7-10 day course of oral antibiotics (eg, cefuroxime, amoxicillin-clavulanate) directed towards cultured organism(s) may be prescribed on discharge, depending on the type of complication. Labyrinthitis may present as a serous or suppurative process. Serous labyrinthitis generally responds to conservative management consisting of myringotomy and antibiotics. Be sensitive to signs of progression of suppurative labyrinthitis, which consists of acute increase in vestibular symptoms and sudden hearing loss. The most important aspect of treatment of suppurative labyrinthitis is bed rest, IV antibiotics, and close observation for evidence of intracranial involvement. Surgical drainage of the labyrinth is indicated in cases with suspected intracranial involvement (on the basis of lumbar puncture results, meningismus, and other diagnostics and manifestations). Facial nerve paralysis may present as a complication of acute or chronic middle ear disease. In the setting of acute otitis media (within 7-10 d), facial nerve weakness is due to edema of the nerve within the bony canal and not due to bone erosion. Therefore, recovery can be expected with conservative treatment of acute otitis media. In the case of chronic otitis media or the delayed onset of facial paralysis, the paralysis likely is secondary to erosion of the osseous facial canal. In this case, immediate surgical intervention is indicated in the form of simple mastoidectomy without exposure of the nerve if the paralysis is incomplete. Incision of the nerve sheath is contraindicated in the treatment of facial paralysis associated with otitis media. Incision of the perineurium facilitates the spread of infection, which normally is prevented by this structure. In rare cases of complete paralysis with loss of electrical excitability, perform decompression of the nerve. Petrositis in its acute form usually can be cured with antibiotics. In chronic cases associated with otorrhea, retro-orbital pain, diplopia, and fever, surgical intervention is indicated. Multiple approaches to the infected petrous cells are possible following a traditional simple mastoidectomy. The safest surgical approach depends on the available air cell pathways leading there. Usually, once the mastoidectomy is completed, the air cell track containing granulation tissue can be followed into the petrous apex and adequate drainage can be obtained. A middle cranial fossa approach may be necessary if there is limited access through the mastoid route. Perform drainage of a subperiosteal abscess of the mastoid with a simple mastoidectomy. Mastoidectomy with exposure of diseased dura is imperative in cases of extradural abscess or granulation tissue, sigmoid sinus thrombophlebitis, and otitic hydrocephalus. Treatment of lateral sinus thrombosis is controversial, but most authors recommend mastoidectomy with bony decompression of the sinus. Following decompression, many authors recommend aspirating the sinus with an 18- or 20-gauge needle. Consider an attempt at thrombus removal if free blood return is absent and particularly if pus is encountered. Some surgeons recommend extending the exposure and clot evacuation until free bleeding occurs. Anticoagulation is controversial. Recommendations for anticoagulation originate from neurology and hematology studies, in which patients have different etiologic factors and pathophysiology. Patients with thrombus confined to the sigmoid sinus should be considered for treatment without anticoagulation in order to avoid the associated risks. Serial imaging should be performed in those cases to assess for clot propagation. Patients with evidence of thrombus progression, extension to other sites (jugular vein, transverse sinus, cavernous sinus) on initial presentation, neurologic changes, persistent fevers, or embolic events should be considered for anticoagulation. Complications resulting from surgical intervention are unique to each operation. They include blood loss, brain herniation, facial nerve injury, hearing loss, and air embolism. Complications specific to mastoidectomy include hearing loss, vertigo, tinnitus, facial nerve injury, altered taste sensation, and the possible need for further surgery. Patients may be admitted for observation and administration of parenteral antibiotics. Neurosurgical consultation is indicated in cases of intracranial complications. Consider infectious disease consultation in all cases. Repeat CT scan and/or MRI studies may be necessary if little or no improvement occurs after the initial surgical and medical intervention. Obtain neurosurgical consultation in cases of intracranial complications. Consider infectious disease consultation in all cases. For intracranial complications, transfer the patient to a hospital where neurosurgical services are available. Transfer of pediatric patients, particularly those with intracranial complications, to a hospital with intensive care facilities may be considered. Obtain follow-up audiograms during and after treatment. In addition, careful monitoring of visual fields and visual acuity is necessary in patients with intracranial complications; visual changes usually signify an increase in intracranial pressure. Also keep in mind that, in cases of intracranial complications, frequent neurologic evaluation is imperative. Thorne MC, Chewaproug L, Elden LM. Suppurative complications of acute otitis media: changes in frequency over time. Arch Otolaryngol Head Neck Surg. 2009 Jul. 135(7):638-41. [Medline]. Penido NO, Borin A, Iha LC. Intracranial complications of otitis media: 15 years of experience in 33 patients. Otolaryngol Head Neck Surg. 2005. 132:37-42. Dubey SP, Larawin V. Complications of chronic suppurative otitis media and their management. Laryngoscope. 2007 Feb. 117(2):264-7. [Medline]. Kangsanarak J, Fooanant S, Ruckphaopunt K, et al. Extracranial and intracranial complications of suppurative otitis media. Report of 102 cases. J Laryngol Otol. 1993 Nov. 107(11):999-1004. [Medline]. Kangsanarak J, Navacharoen N, Fooanant S, Ruckphaopunt K. Intracranial complications of suppurative otitis media: 13 years' experience. Am J Otol. 1995 Jan. 16(1):104-9. [Medline]. Popovtzer A, Raveh E, Bahar G, Oestreicher-Kedem Y, Feinmesser R, Nageris BI. Facial palsy associated with acute otitis media. Otolaryngol Head Neck Surg. 2005 Feb. 132(2):327-9. [Medline]. Choi SA, Kang HM, Byun JY, et al. Analysis of differences in facial nerve dehiscence and ossicular injury in chronic otitis media and cholesteatoma. Acta Otolaryngol. 2014 May. 134(5):455-61. [Medline].